Can I delete all my data and start over with the same account? 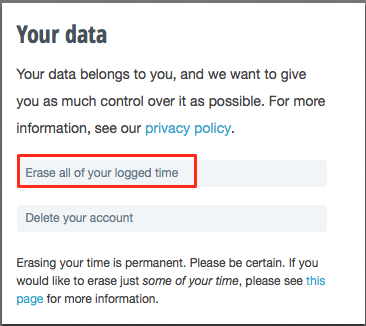 If you want a fresh start but don't want to erase your account and start over, you can delete all of your logged time by going to Account Settings > Account. You'll find the option Ease all your logged time under "Your data" section on the lower right side of the page. Once you erase the data, we cannot get it back for you. It's permanent.